Base ten manipulatives help students grasp large-value number concepts piece by piece. Each of our components are based on the ones block, a single cubic centimeter made from plastic. 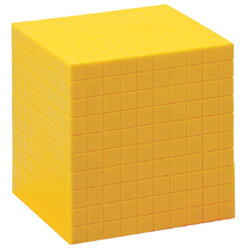 Available in units ranging from thousandth chips to thousand blocks, they're perfect models for numeration!